An automotive tier one supplier contacted us to discuss our thermoset molding expertise regarding a high-volume thrust washer component to be used in various transmission applications. The customer requires parts to be resistant to heat and automotive fluids, while providing tight molding tolerances. Using SBNA RX 865 - a phenolic thermoset material - the thrust washers are injection-compression molded from an 8-Cavity tool in an 80-ton thermoset injection molding machine. Finished parts weigh roughly 3.2 grams and are shipped to a customer plant in Tennessee. 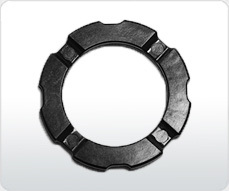 Product Description Phenolic Thrust Washer used within automotive transmission application.